The EZ Lift Chair Table is perfect for lift chair or recliner users. Not only is it height adjustable, but it also can swivel to the side of the chair when not in use and do double duty as a side table. To install the EZ Lift Chair Table, just slide it under the chair's base and the weight of the chair will holding the table securely in place. Caregiver from Texas would recommend this to a friend. 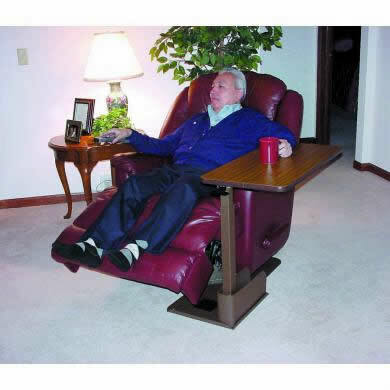 This EZ Lift Chair table is easy to assemble and operate. 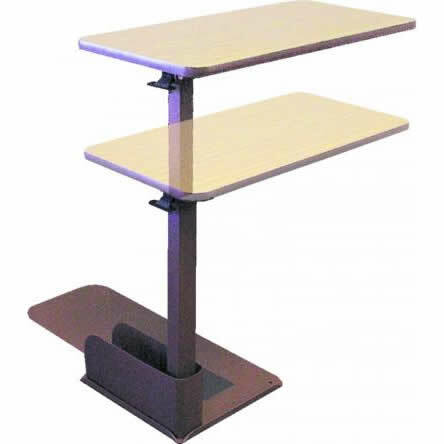 Table wobbles because rectangular post does not fit tightly over the round base post. The addition of a close table that can be adjusted and swung out of the way is most helpful. My Mother did not use. Denise from Houston, TX would not recommend this to a friend. Difficult assembly. Difficult turning ability. Unsafe. Expensive for what it is. Very flimsy. This is being stored in our garage. See above cons. It is not worth the money. I wish medical equipment manufacturers actually did focus groups and such to understand what the elderly population needs. Lack of thought/intelligence in design, and overall terrible ease of use.